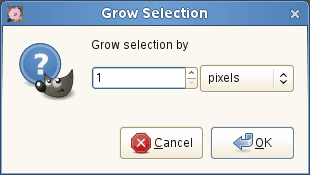 The Grow command increases the size of a selection in the current image. It works in a similar way to the Shrink command, which reduces the size of a selection. You can access this command from the image menubar through Select → Grow. You can enter the amount by which to increase the selection in the text box. The default unit of measurement is pixels, but you can choose a different unit by using the drop-down menu. 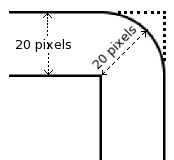 If you do not want rounded corners, you can use the Rounded Rectangle command with a 0% radius.